Testing, testing, anyone still out there? Ah, good. Sorry folks for the lack of postings - first there was the new studio, then shoulder surgery in June, then the recovering from shoulder surgery, then the heat. Two weeks ago the sun came out, and us Glaswegians are used to stopping everything to enjoy every moment of such a rare event - but it has been two weeks now, so we are all gradually getting back to normal life. So I am beginning to use an easel - it has been well over five years, pre-oil painting days, since I have been able to thanks to a pesky frozen shoulder. And boy, it is amazing. So much I have heard about/read/seen suddenly makes more sense. I can lay things out and not have to move a chair to lift things up - suddenly using different brushes for different strokes is easy. And I can both see all the colours on my palette at a glance and reach them without twisting. Also, the turps is no longer at my elbow. It is still early days (four weeks post-op) and I am gradually building up how long I can stand and paint - up to about six hours with breaks - but these are my first finished efforts. 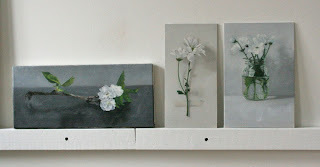 They are still little paintings, and some of the detail is done with the painting in my lap as previously. But I am quite pleased with the direction I am taking - bigger brushes! more subtle colour/tone changes! more thought out compositions! and have many, many plans for when I can do more. And I will start posting again, promise. These are lovely. I especially like the one on the right.